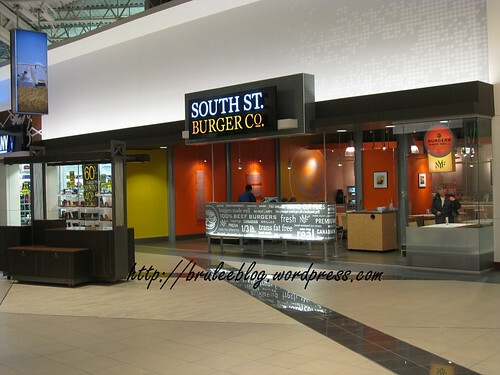 During my visit to CrossIron Mills I also stopped for a meal at South St. Burger Co. Owned by the same company that owns New York Fries, this location is the first to appear outside of Ontario. 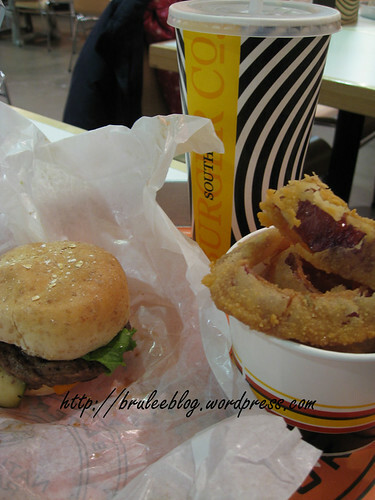 I wasn’t terribly hungry, so I a small burger with monterey pepper jack cheese and onion rings. The beef patties at this location are made with Spring Creek Ranch beef. There are four cheese to choose from – cheddar, swiss, the jack I had, and goat cheese. You could also get free toppings for your burger – everything from guacamole and mango chutney to cucumbers and jalapeno peppers. Their onion rings are made with fresh cut red onions, and you can also order New York Fries’ fries and poutine if you so desire. The red onions gave the rings a pleasant bite and I would happily eat these again. My small burger was tiny; their normal burger has 1/3 lb of beef and in contrast my burger looked like an oversized slider. The taste was good and the meat was cooked nicely, although I would have liked a greater ratio of patty to bun. I think the onion rings made a greater impression on me though. Is it worth going all the way to this mall just to have these burgers? Probably not. But if you’re stuck in there, the South St. Burger Co. is a good option where you can to rest your feet and fill your stomach. I had lunch there when they first opened, a good option while at the mall. The fries pulled me in.